A week or two back I returned to the Doctor Who Experience at Olympia as I had heard there had been some revisions and additions to the displays. 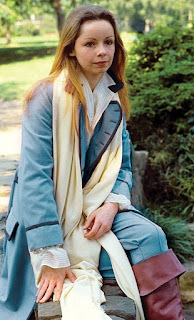 Most of the additions, naturally, are relating to the current season, but the revisions are mainly centred around Tom’s costume. 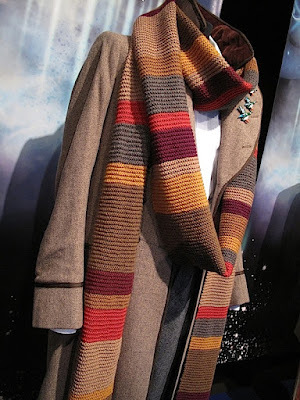 When the exhibition first opened back in February, the scarf on display was apparently two of the promotional scarves issued by the BBC during the Fourth Doctor’s era. The colours and design is pretty good, but it wan’t quite right. 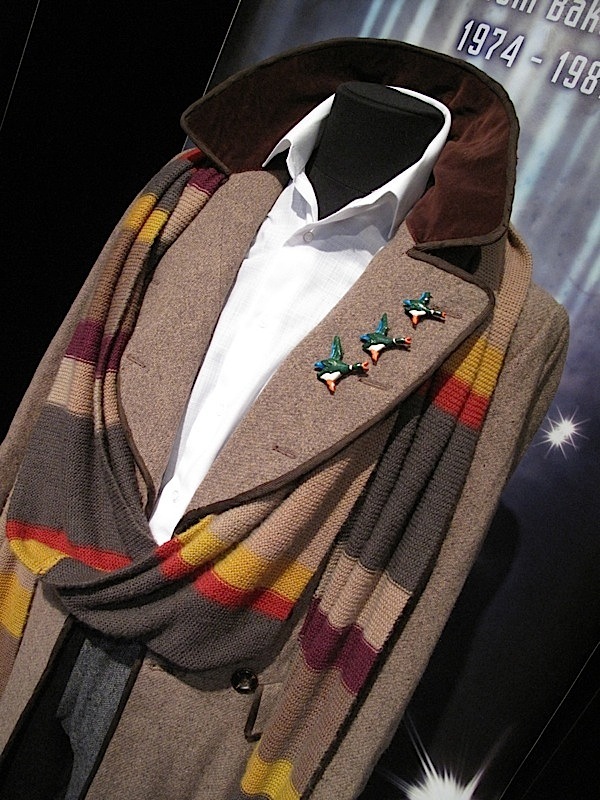 Well now there is a new, much improved scarf on the display. I gather the scarf has been knitted by a fan who knows the exact pattern and colour match for the yarns. The garter stitch is much deeper and more noticeable than before. Further on in the exhibition I spied another Tom Baker scarf which wasn’t there before . . . So, my college tutor has been an enormous help with my initial efforts at pattern grading the Romana Pink Frock Coat up in size. I am making a special cornflower blue version for a client’s wife, so I now need add a bust allowance, something I’ve never needed to do before! I have been given the measurements needed and with the guidance of my college tutor we now need to incorporate these into the existing pattern. First thing to do is trace off the front panel onto some paper, and cut off the lapel at the centre front line. The remaining part leaves me just the chest, around the underarm and up to the shoulder. The bust point is then estimated, being relatively central in the chest area. We are looking to create the capacity here. I then cut horizontally, passing through the bust point; and then from the shoulder without breaking the shoulder seam, down through the bust point again and on to the waist seam. The cut pieces are then manipulated to add capacity as shown (see left, bottom). A sheet of pattern paper is laid carefully over the top and the outermost shape is traced off (see right). To then create the bust shape, the slice to the underarm and waist are converted into darts, converging on the bust point, but stopping an inch short.